Let me introduce you to my new favourite dress! The shape may well look familiar because it's based on my Dolores batwing pattern, subtly reworked for a third-trimester pregnant figure, and I couldn't be happier with (or currently more reliant on) the result. If you read my previous post, you will have seen that adapted versions of the regular Dolores batwing pattern featured heavily in my four-to-seven month maternity wardrobe. 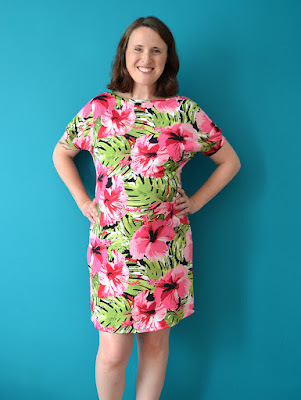 However, towards the end of that period I found that those dresses stopped being suitable: the mid-section was starting to stretch out of shape and the side seams ended up curved to accommodate my growing belly, and the hem was no longer even. 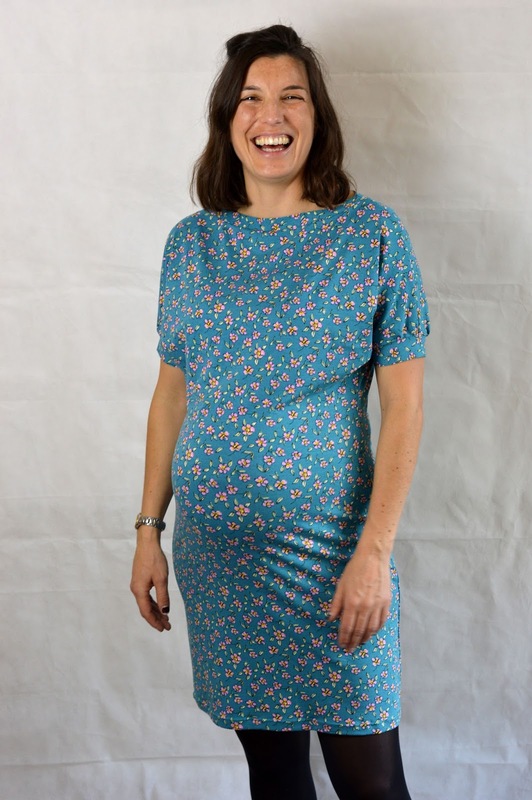 So around the time I finished drafting my Cordelia maternity camisole pattern, I began work on a specific maternity dress version of the Dolores pattern which took all those issues into account, as well as a couple of other bits I wanted to change. After extensive fitting to multiple third-trimester bodies with both long-sleeved and short-sleeved options, I'm hoping I've nailed it. So lemme tell you about this Hawaiian/tropical fabric. 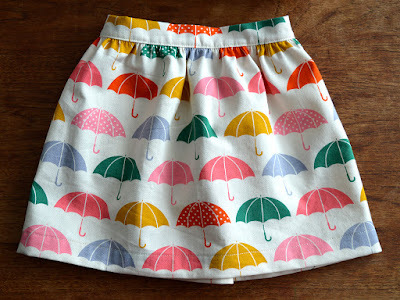 Back in May, the 12-year-old, but admittedly new-to-me, online craft shop Sew Essential got in touch offering me some fabric to test and blog about. You know me, never one to turn down free fabric, so I asked for a couple of metres of this vibrant John Kaldor slinky knit and they kindly obliged. Sadly, the pink colour way seems to be currently out of stock, but they have it here in blue, as well as some other lovely prints. My initial intension for this fabric was to make maternity leggings after receiving confirmation that it has a four-way stretch. But when it arrived I discovered it was was too lightweight and slinky for that purpose. Then, when the development of this new Dolores maternity dress pattern called for some slinky, drape-y knit, a massive AHA! occurred, and a beautiful marriage of pattern and fabric was born. Pattern details and testers please! Like it's predecessor, the Dolores maternity dress pattern has two sleeve options, long and short, making it a versatile pattern for different climates and occasions. It looks epic in a fun, crazy print, and also elegant and work-appropriate in a more subtle fabric choice. So, as the title of this post suggests, I'm on the hunt for willing pattern testers. 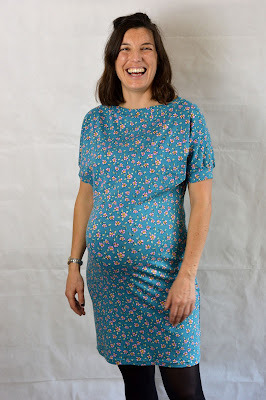 If you, or somebody you know, are currently in your/their third trimester of pregnancy (27 weeks +), you would like to try this pattern and are able to give me your feedback by 18th September, then please send me an email to sozoblog (at) g mail (dot) com. Testers will receive a zip file including a PDF pattern file (that will require printing out and taping together), a PDF instructions file (that you can read from a screen if you prefer to save on printer ink) and a list of questions to help formulate your feedback. If this appeals to you, please get in touch, I'm aiming to send out the files on 1st September. Thanks so much in advance! During both my pregnancies I've written a few blog posts about my maternity sewing plans, and then during my first pregnancy I wrote a couple of posts about what I actually wore (see the six month one here and the eight month one here). 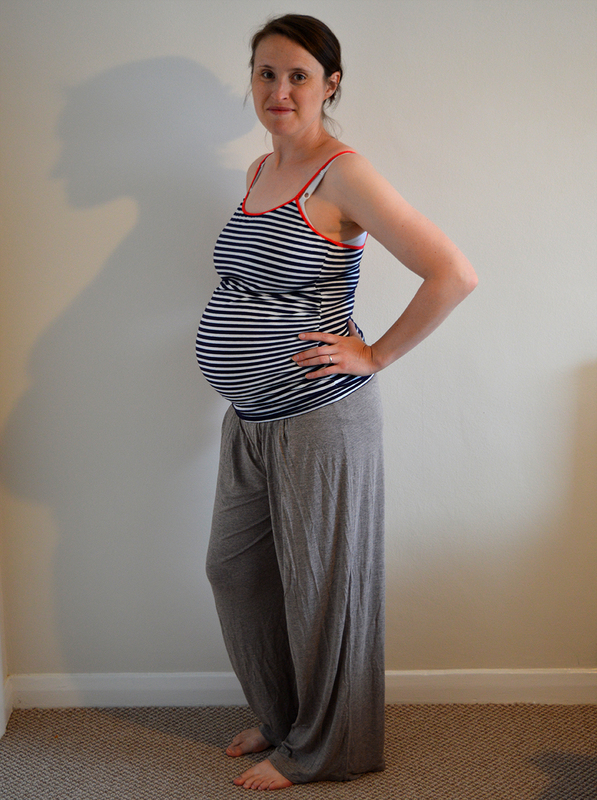 A few lovely readers have commented in recent months that they found these posts really useful for getting their heads round preparing for their own pregnancy wardrobes, and one reader asked me to do an update on what I have been wearing this time round. So here you go: a summary of the (predominantly handmade) items I wore between being four and seven months pregnant during my second pregnancy. Four months onwards is really the time that I found that only the most smocky, stretchy or over-sized garments in your regular wardrobe still fit. This is the point that you're probably going to need some specific maternity garments, whether they be mass-manufactured or homemade. Obviously, one woman's maternity wardrobe requirements may vary wildly from another's. 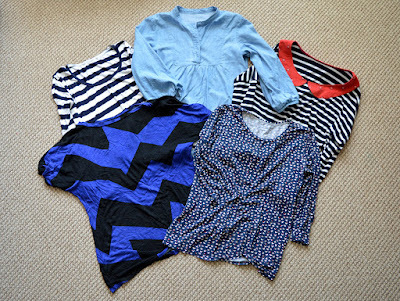 But for me, as a self-employed person-slash-SAHM living in a temperate climate during late spring and summer, these are the items I wore during the four-to-seven month maternity period (plus some jackets and cardigans). 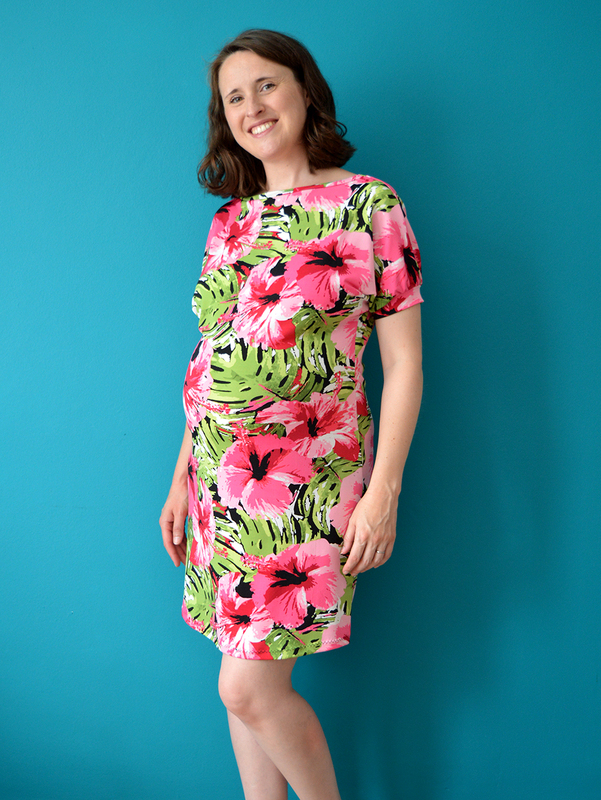 The black and nautical short-sleeved jersey dresses were both made during my first pregnancy and based on what was to become my Dolores batwing pattern. They have been leant out to several women over the last few years before coming back to me for my second pregnancy. If I recall correctly, they were made by grading out from a size 12 to a size 14/16 at the side seams from just below the bust. I've worn both on their own as dresses, but also layered on top of my leggings when the weather demanded it. The stripy faux-Boden tunic was almost always worn with leggings underneath, and I'll probably take all three of these dresses/tunics in at the side seams one day so that they will have new incarnations as post-natal garments. 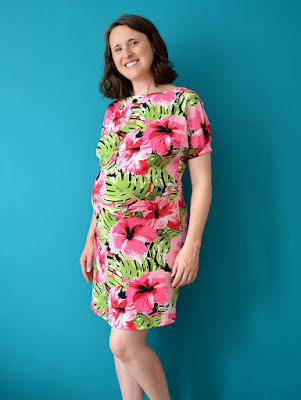 I'm not really into wearing full skirts, but I have seen other women wear Vogue 8728 (Jennifer Lauren Handmade highly recommends this one for maternity wear) and the Colette Patterns Moneta dresses during this stage of pregnancy too. Knit/jersey is always going to feel better, particularly when you're expanding! 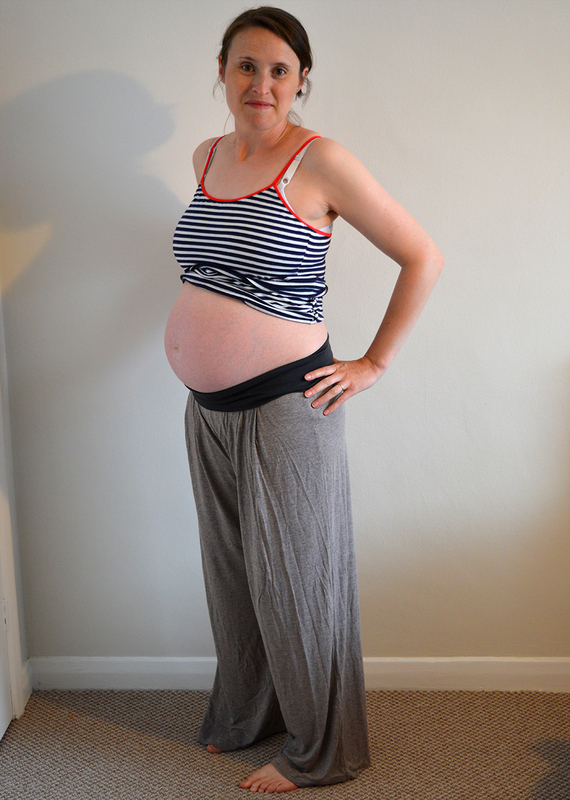 And that is reflected by how many tops I own for this stage of pregnancy that are made from woven fabric (i.e. one) compared to knit. The denim Tova top looked great with all the maternity jeans and trousers I borrowed, plus when it was chilly I wore the long-sleeved stripy T-shirt underneath as well. 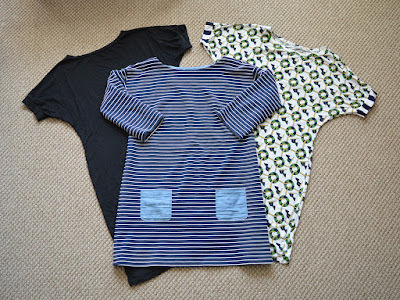 The long-sleeved stripy T-shirt and bird print T-shirt were made from a self-drafted pattern, but I'm sure the Grainline Lark T-shirt pattern would make a great basis if you're looking to make something similar. It'll probably come as no surprised that the jazzy print short-sleeved tunic and the Peter Pan collar top are both based on my Dolores batwing pattern, and made by blending out the size at the side seams (as specified on the dress section above). 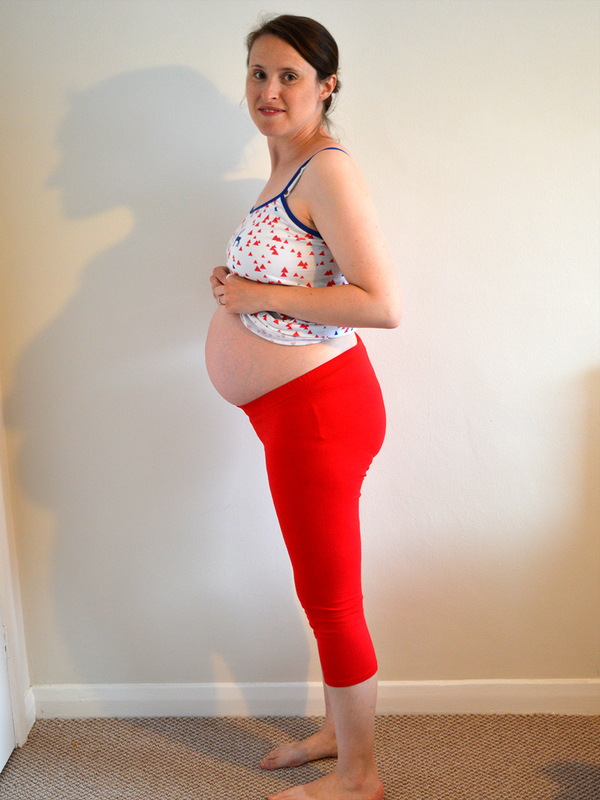 As I've mentioned before, I tend to prefer garments that sit under my bump rather than over so I developed my own maternity leggings pattern that I hope to release in PDF form one day. I did also wear a rather ratty second hand black pair that a friend leant to me that sat fairly low under my bump, but I stopped wearing those entirely once I'd made these two pairs. 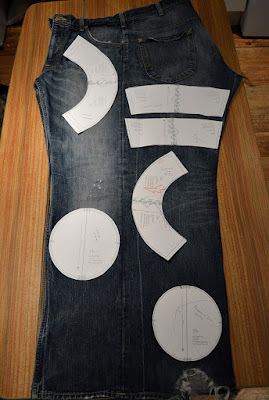 I had vague plans to refashion some existing jeans into maternity jeans by cutting away the front section and adding a panel of jersey, but I ultimately decided that life is too short. Instead I put a shout out on Facebook in case any of my friends and acquaintances had some maternity trousers or jeans I could borrow. About five lovely ladies stepped up, and I received a total of 15 pairs to use during this pregnancy! I have worn several of the others, but the four pictured above have been the ones I that saw the most action in the four to seven month period. If I had been shopping for maternity bottoms myself, I wouldn't have gravitated towards any of these, either because of their style or colour. 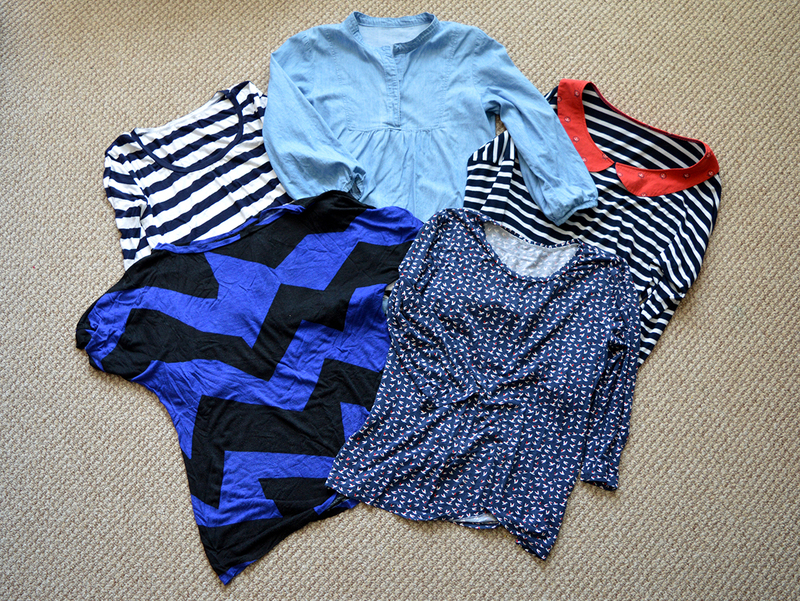 But I've really enjoyed wearing each of them, as well as being pushed slightly out of my stylistic comfort zone. 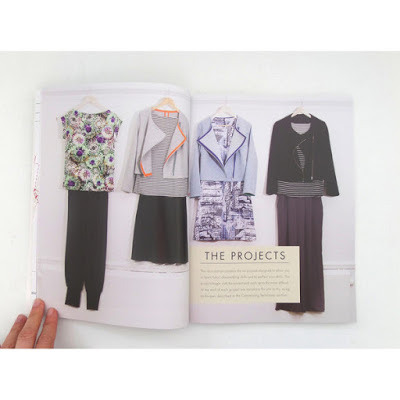 Rather than making (yes, there are specific maternity trousers sewing patterns out there!) 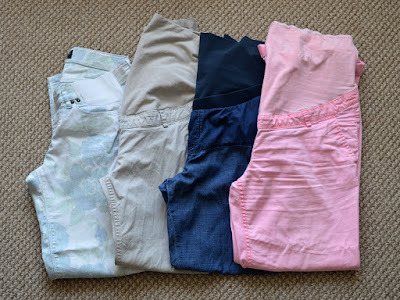 or refashioning maternity trousers or jeans, I really recommend trying to borrow some or, failing that, buying them secondhand (eBay is a great source for secondhand maternity wear). My navy and mustard Cabernet cardigans have been amazing through out my pregnancy, I'm so glad that I made them. My Woodland stroll cape provided a cosy layer when it was chilly, and my slightly over-sized Sailboat raincoat kept me dry at times too. At night I wore large dude-T-shirts and my usual jammie bottoms. I'm lucky that my work and childcare responsibilities during this part of my pregnancy meant that I could dress pretty casually. 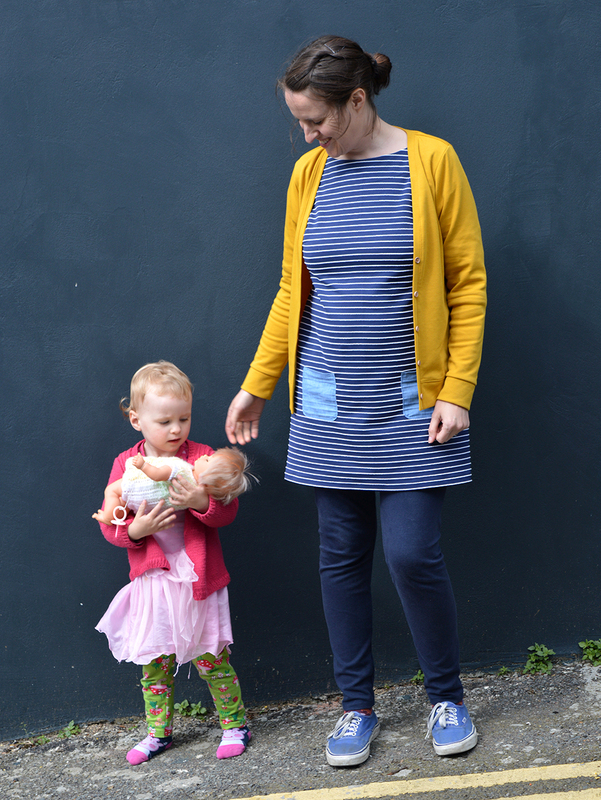 I learnt a lot of lessons from my first pregnancy, like sticking to one predominant colour, in my case blue, so that mix-and-matching is easier, and that no one will notice if you wear the same handful of items in different combinations all the time. 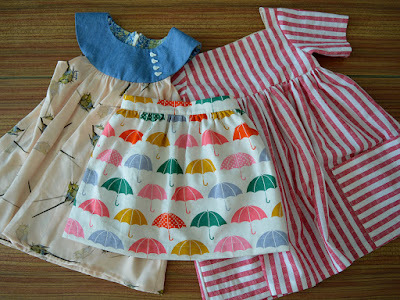 And I was able to reuse a number of the items that I made for that first pregnancy too. 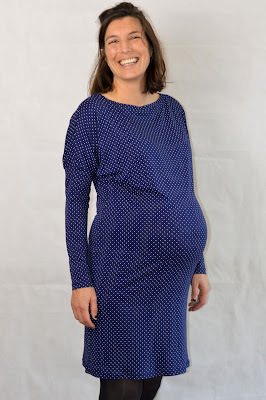 All the clothes I made during this pregnancy that I wore up until seven months in are either suitable for non-maternity times (like the Tova top and Cabernet cardigans), or can be easily altered to fit a non-pregnant form (all my Dolores dresses and tops and the faux-Boden tunic). 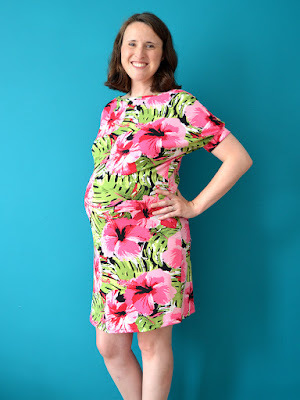 If you're preparing your own pregnancy wardrobe, I wish you a smooth ride and all the best. My last blog post was basically a pile of kid's clothes that I've made, and this one is basically the same. Last week was the summer 2016 edition of the Kid's Clothes Week challenge/sewalong. As I'm sure you know by now, the only criteria for taking part is to sew clothing for children for at least an hour a day for a week. Each instalment has a theme, that you can adopt or ignore as you please. 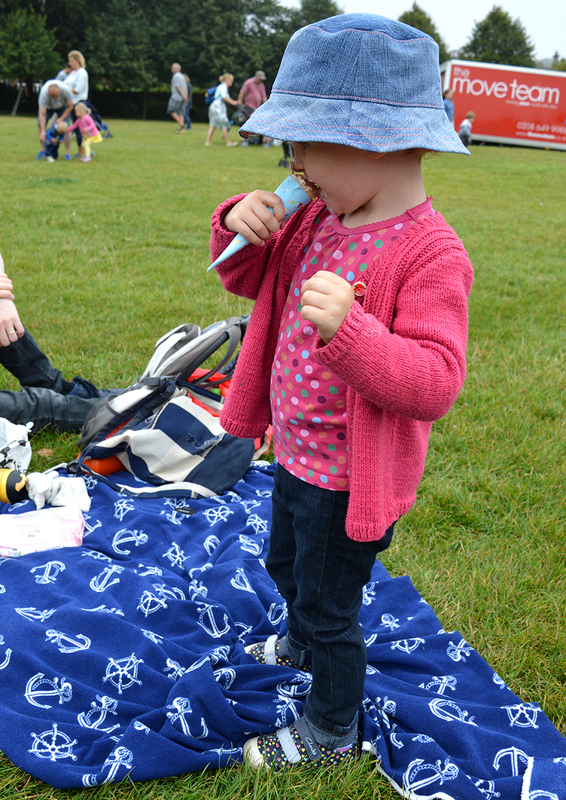 This summer's theme was 'Celebration', and I decided to translate it as a celebration of the little girl that my baby is turning into. So that meant embracing her defiantly girly, dressy clothing preferences! I failed to do any sewing on Monday or Friday, so I made sure I caught up by doing more than an hour on other days and extended it to include Monday this week. 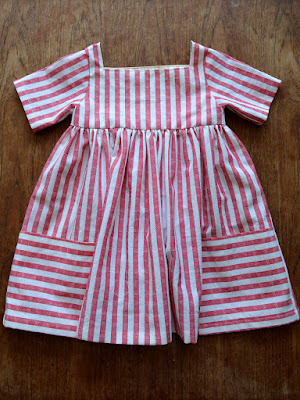 I managed to complete three woven garments, a skirt, a tunic top and a dress. I actually cut out the tunic top months ago, and it was great to be able to use KCW to fit in the actual construction, since I had clearly been stalling for various reasons. I intend to write individual posts for each of these garments in due course. However, I must admit at this point that the dress is the only one that Dolores hasn't refused to even try on! So modelled photos may be thin on the ground. 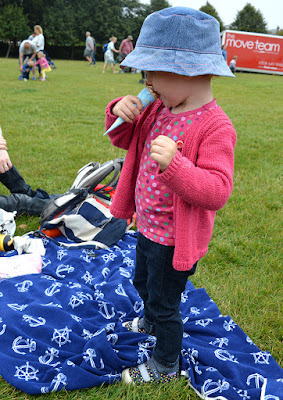 Any tips on getting head strong toddlers and children to put on clothes when they don't want to?! Refashion Friday: The Refashioners 2016 Result! 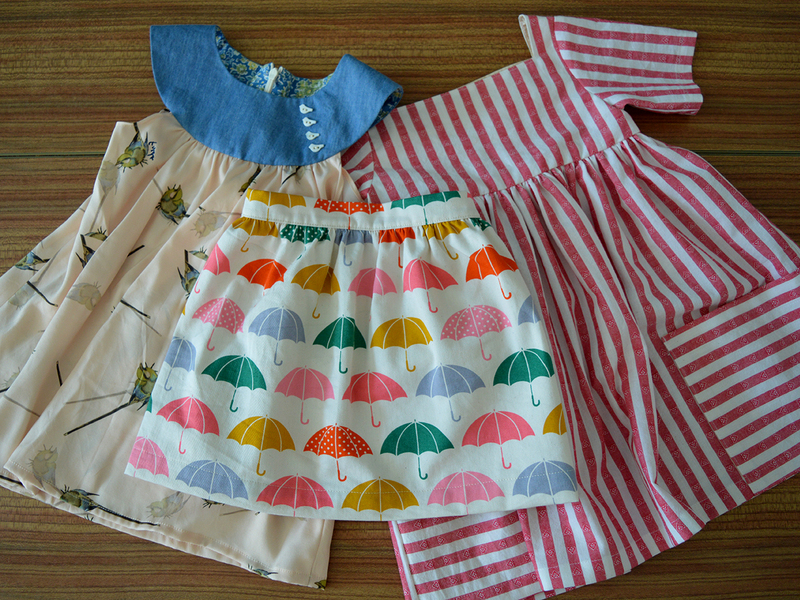 Ohmygoodness have you even seen the refashions coming out of this year's Refashioners blogger challenge hosted on at Portia's Makery blog?! TOO MUCH AWESOMENESS!!!!! I genuinely didn't expect the level of innovation AND wearability from every single instalment so far. If this doesn't get sewers running for their nearest charity shop/thrift store/op shop, then literally nothing will. Well, until they see my contribution perhaps!! I jest. 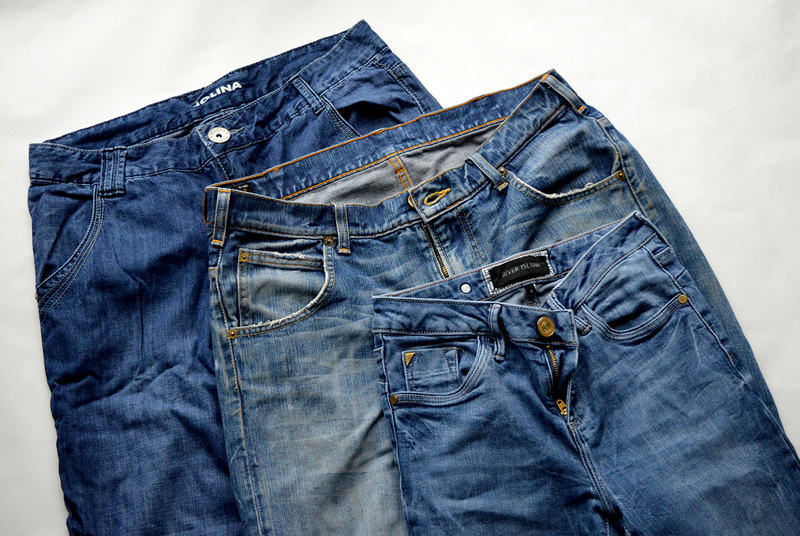 I'm really pleased with the three projects I created from the three (ok, it ended up being four) pairs of unwanted jeans pictured below. 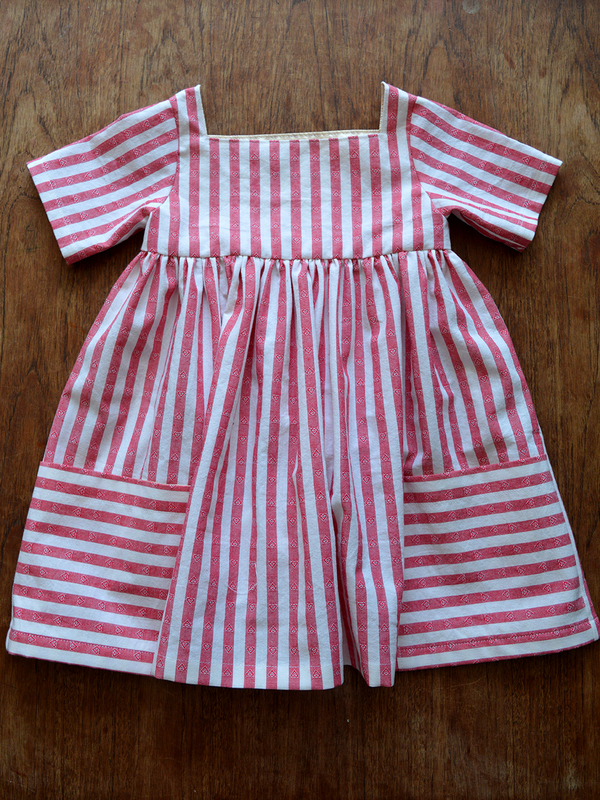 The garments I made are useful, well-made items that I know will see lots of use. However, I'm just not in the headspace these days to respond to this brief as creatively as the other bloggers seem to have so far. 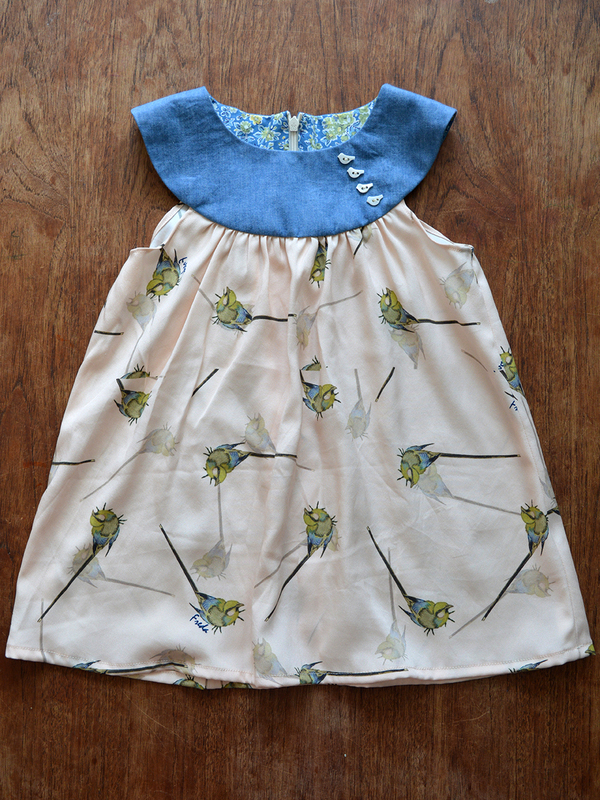 But no matter, if I have been able to inspire some people to look to existing textiles rather than always opting for metres of new fabric to indulge their passion and clothe their kids, then I couldn't be happier. What's been your favourite of the blogger jeans refashions so far? For me, from what we've seen so far, it's a toss up between Rosie's graduated shades of denim dress, Joost's epic denim shoes and Megan Nielsen's panelled dress. 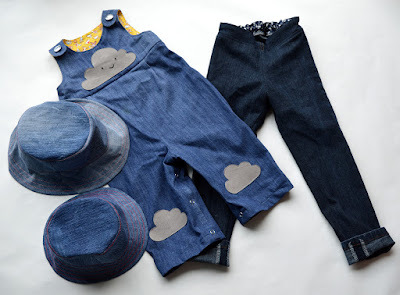 Don't forget that there's a hefty prize for the winner of the community challenge, so why not have a bash at a jeans refashion yourself? 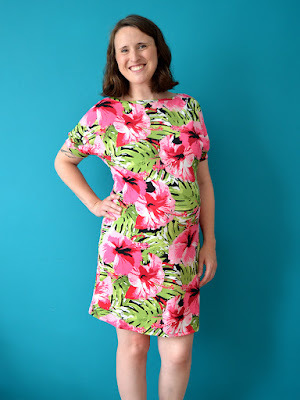 Not that anyone's keeping tabs, but I've got one final posts-worth of makes from my Spring/preggers sewing plans to share with you. It's all about the comfy bottoms! Warning: not particularly glamourous images contained below. And look away now if big ol' preggers bellies freak you out! 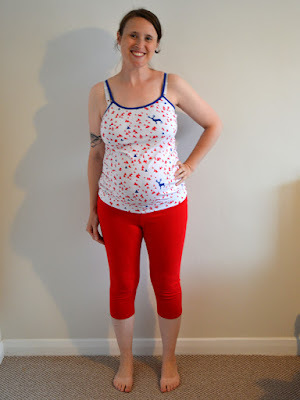 In the end, I decided not to try a maternity jeans refashion, NOR did I refashion the thrifted leopard leggings, NOR did I make a maternity knit skirt. Instead I borrowed a stack of mass-produced maternity jeans and trousers from several friends, decided to keep the leopard leggings (my only non-maternity pair of leggings) as the are, and accept that I'm just not particularly a skirt person, especially during a time when sitting crossed-legged is increasingly difficult! So I made some leggings, some navy blue (pictured at the very top of this post), some red (pictured above and below, although I doubt you've missed them!). In the aforementioned Spring sewing plans post I was talking about a couple of pairs of traced/self-drafted leggings/treggings things that I made during my first pregnancy that I then wore to death during and after. As I admitted in that post, I was never entirely happy with the fit of those two original pairs, so I planned to buy another sewing pattern and adapt it in the hope that I would land on the perfect fit. Then I realised what a lame-arse I was being. Those two pairs were so damn close to what I was hoping for, why bottle out and assume someone else's pattern drafting would be closer to the mark? 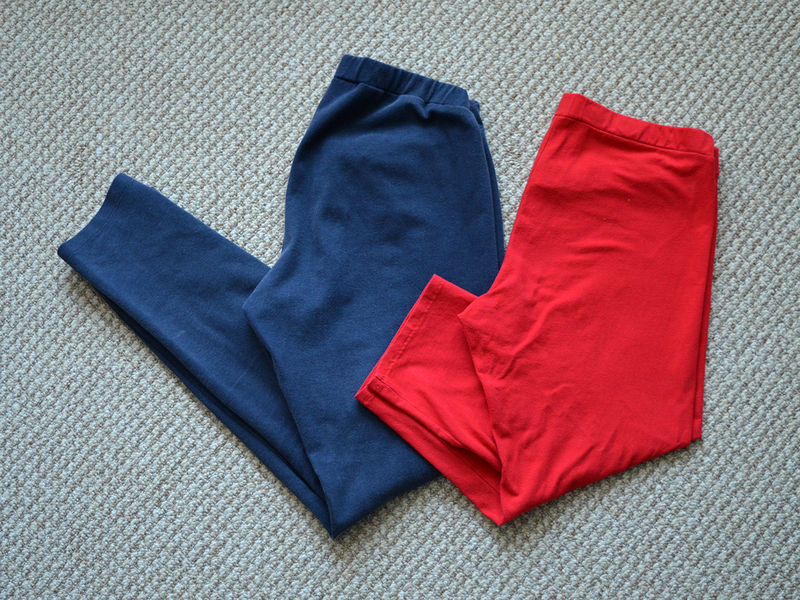 My final pair of comfies should have been one of the easiest and quickest makes ever. Except they weren't. No fault at all of the pattern itself, mind. For these I used the wide legged trouser pattern from Wendy Ward's 'Beginner's Guide to Dressmaking' book (pictured below). I teach at her workshop in Brighton where she has all her patterns on card for students to trace out and make during a class. I told Wendy of my intentions to make the trousers for maternity-and-beyond use and was moaning that I couldn't find any suitably drapey fabric, and she very generously offered me some soft and slinky grey knit that was lurking in her stash. So the next time I was at the studio, I traced and cut out the trousers, then proceeded to put all of it, scraps and cut pieces directly into the scraps bin whilst tidying up! I didn't realise what I had done until I was sitting on the train heading home. I sent a panic text message to Wendy and she later rescued the pieces for me! I felt more than a bit stupid. The next stupid thing I did was choose some inappropriate fabric for the waistband. The waistband piece requires thicker, more sturdy knit than the legs (the latter can also be made in drapey woven fabric). I used some of the leftovers from my MIY Collection Brightside shrug, which although blending nicely colour-wise, didn't have anywhere near enough stretchiness to perform well as a waistband. 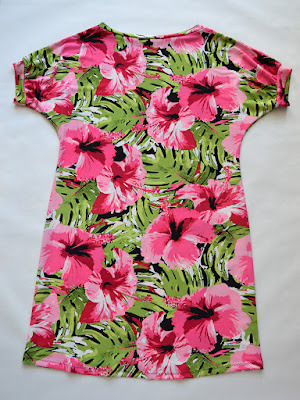 I was bemoaning my mistake to Debbie, one of the regular students at Wendy's MIY Workshop, because she is a big fan of this pattern and has made it for herself and virtually every female she has ever met. Bless her, the next class she brought in the leftover waistband fabric from a pair she'd recently made for her hairdresser, so I cut out a new waistband and replaced the old one! Once again because of my preference for firmly-under-the-bump waistbands, I cut the waistband piece approximately 3/4 the depth of the original pattern piece so there wouldn't be so much fabric round my waist (the waistband is designed to fold in half). I'm not showing these trousers off particularly well in these images (plus they have been washed and folded up without being ironed! ), but you'll have to trust me that they feel luxuriously slinky. Although a massive improvement on the first attempt, waistband has ended up still feeling a bit tight for a third-trimester belly, but I know that I'll wear the living hell out of these when this pregnancy is over. Massive thanks to Wendy, Debbie and Girl Charlee for helping me expand my comfy-trouser selection!!!! What about you? What is the most comfortable (if not glamourous-looking) garment you've ever made?